Next week, fans in the U.K. will get to see a brand new Harry Potter story unfold when the stage play Harry Potter and the Cursed Child opens for previews on June 7, ahead of its first official performance on July 30. Actors Jamie Parker (Harry Potter), Noma Dumezweni (Hermione Granger) and Paul Thornley (Ron Weasley) were cast in December, with the full cast announced in February, although it was never confirmed which characters the other actors are playing. Today we have new photos of some of these actors in character, along with details on their roles. 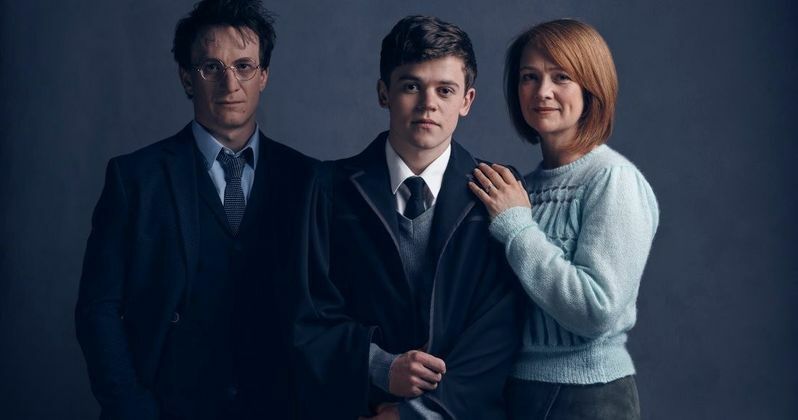 Pottermore revealed new photos of Jamie Parker as Harry Potter, alongside Sam Clemmett as Albus Severus Potter and Poppy Miller as Ginny Potter. The photos below reveal some of the actual costumes these actors will be wearing, along with a glimpse at Harry Potter's infamous scar. Here's what Jamie Parker had to say about his costume. "He's wearing a suit because he's a Ministry man, but he's not just a bloke in a suit, that's way too anonymous. And it sounds strange but we talked around a lot of different suits, because there are suits and suits, and a lot of them we put on and we went 'Mmm it's just not right.' With all the character's costumes we want them to be instantly familiar when people see them, so that people feel like the story's safe in our hands, and that we're taking that responsibility seriously.' They're (the glasses and scar) just iconic. These are stories that people have lived with for their whole lives, they've grown up with and now they're adults re-joining the tale, picking it up where they left off and I'm one of them. In a sense you don't need more than the scar and the glasses, you kind of go, 'there it is' and I don't really know how to put it into words, it's just immeasurably exciting and I can't wait to show it to people. It's a unique gig in the sense that you have seven volumes of backstory that you get to bring on with you. And we were all very keen to make sure that the first time you see Harry it just feels right." The rest of the cast is rounded out by Nicola Alexis, Helen Aluko, Jeremy Ang Jones, Rosemary Annabella, Annabel Baldwin, Jack Bennett, Paul Bentall, Anthony Boyle, Zoe Brough, Sam Clemmett, Morag Cross, Cristina Fray, Rudi Goodman, Claudia Grant, James Howard, Christiana Hutchings, Lowri James, Chris Jarman, Martin Johnston, Bili Keogh, Chipo Kureya, James Le Lacheur, Helena Lymbery, Tom Mackley, Barry McCarthy, Sandy McDade, Andrew McDonald, Adam McNamara, Poppy Miller, Tom Milligan, Jack North, Alex Price, Stuart Ramsay, Nuno Silva, Cherrelle Skeete, Esther Smith, Nathaniel Smith, Dylan Standen and Joshua Wyatt. Among these names are seven child actors who will alternate between roles. With previews starting next week, hopefully we'll get confirmation about who the rest of these characters will be. Based on an original new story by J.K. Rowling, Jack Thorne and John Tiffany, Harry Potter and the Cursed Child is a new play by Jack Thorne, directed by John Tiffany. It will receive its world premiere in London's West End at the Palace Theatre this summer and is the eighth story in the Harry Potter series and the first official Harry Potter story to be presented on stage. Readers and moviegoers last saw Harry waving off his children at Platform Nine and Three-Quarters in Harry Potter and the Deathly Hallows - Part 2. Cursed Child will pick up the story, officially the eighth in the Harry Potter canon, after that moment. It was always difficult being Harry Potter and it isn't much easier now that he is an overworked employee of the Ministry of Magic, a husband and father of three school-age children. While Harry grapples with a past that refuses to stay where it belongs, his youngest son Albus must struggle with the weight of a family legacy he never wanted. As past and present fuse ominously, both father and son learn the uncomfortable truth: sometimes, darkness comes from unexpected places. Take a look at these new photos below, and stay tuned for more on Harry Potter and the Cursed Child.